The state of the digestive system can be indicative of a woman's overall health. Many women report that digestive problems begin to occur in perimenopause, or the years leading up to menopause. Not only can digestive problems cause discomfort, but they can also lead to more serious health concerns. Hormonal imbalance during perimenopause is one of the primary causes of digestive problems for women between the ages of 45 and 55. Fortunately, there are treatments that can bring a woman's hormone levels back in balance and relieve her symptoms. Continue reading to learn about digestive problems, their causes, and the different treatment options available. Women are twice as likely as men to develop digestive problems. Digestive problems - also known as gastrointestinal problems or dysbiosis - can come in many forms, such as constipation, diarrhea, and bloating. Each form has to do with how food is broken down once consumed. Because the digestive system is a complex function of the body, issues can arise anywhere along the trip that food takes. Digestion involves the process of digestive enzymes breaking down food and moving it through the digestive tract. Digestion begins in the mouth, with the act of chewing and swallowing, and is completed in the small intestine. Once food or liquid is swallowed, the stomach then takes over by storing the food and liquid, mixing the food, liquid, and digestive enzymes produced by the stomach, and finally emptying the contents slowly into the small intestine where nutrients are absorbed. The mixture then moves to the large intestine and colon and waits to be expelled as feces. Continue reading to learn more about the causes of digestive problems. While there are many causes of stomach problems that are not associated with hormones, there are many that may have hidden connections. More women than men are diagnosed with conditions such as irritable bowel syndrome, which may indicate that estrogen plays a larger role in stomach problems than has been thought. Some stomach problems are mild and will clear up on their own, but others may need treatment to improve. If you experience any type of severe symptoms relating to your stomach or digestive tract, you should seek medical advice to ensure that you do not experience adverse effects. Although there are many potential causes of digestive problems, hormonal imbalance is one of the primary factors during perimenopause. As a woman's body prepares for menopause, the production of estrogen and progesterone fluctuates and eventually decreases. These hormones regulate many different functions in the body. Because of this, women can experience a number of symptoms, including digestive problems. Cortisol is a "stress hormone" produced by the adrenaline gland and is involved in stress responses. It is known to impede digestion and create digestive problems, among other adverse reactions, such as anxiety. As a result of imbalanced hormone levels during menopause, there may be times with high levels of cortisol in the body. 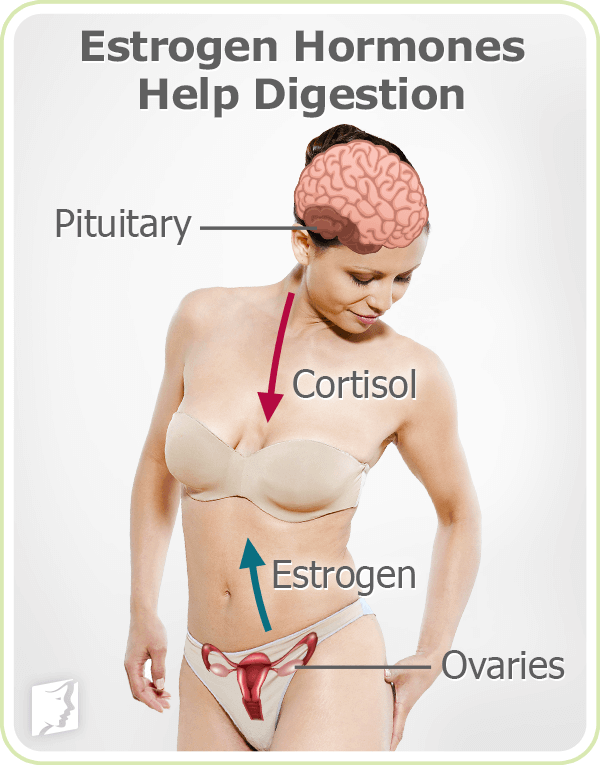 Estrogen has an effect on the stress hormone, cortisol. When estrogen is too low, levels of cortisol rise, raising blood pressure and blood sugar, and slowing down the release of stomach acid and the movement of digested food into the small intestine. This can create some of the symptoms of digestive problems, such as gas, bloating, and constipation. 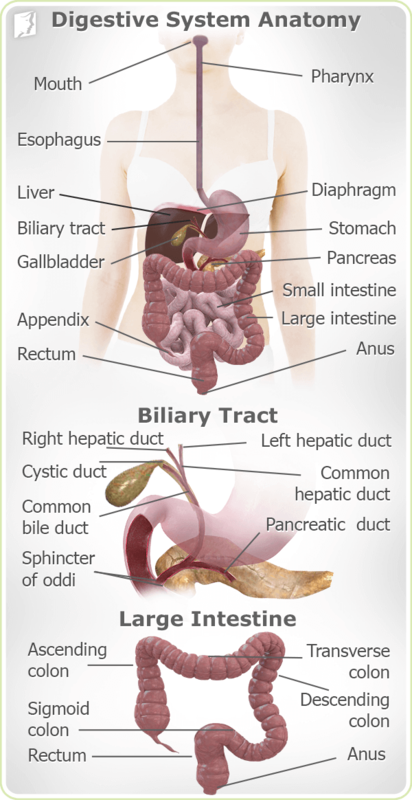 Continue reading to learn difference options available to treat digestive problems. Slow digestion, also called gastroparesis, is a hormonal imbalance symptom that haunts many women throughout their reproductive lives. Discover more about further causes of the digestive complication as well as the solutions that are available for ultimate relief. Digestive problems can be an annoying and unpleasant symptom at any point in time, but the frequency of these problems may increase during the menopause transition. 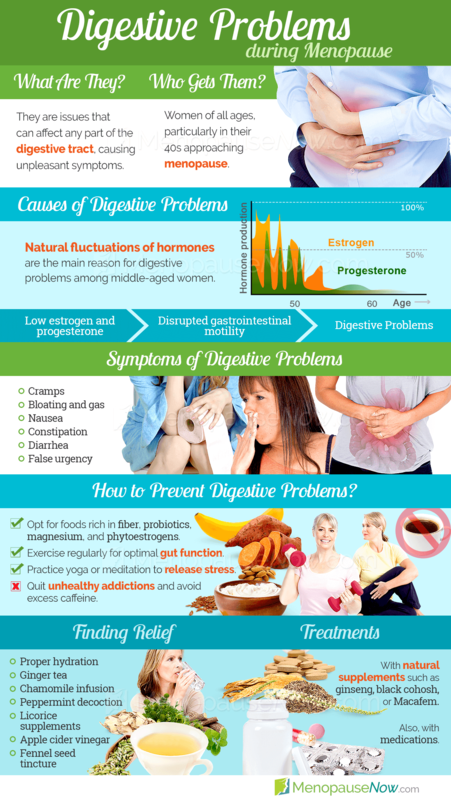 Click the following link to learn more about some of the causes and treatments for digestive issues during menopause. When exploring treatments for digestive problems, it's important to start with the lowest-risk options and work from there. This means that lifestyle changes are generally the best place to begin. For instance, sometimes digestive problems can be alleviated simply by drinking more water or eating a balanced, fiber-rich diet. Typically, combining lifestyle changes and alternative medicines will produce the best results. Alternative medicines can be different herbs and supplements, or even techniques like biofeedback. When seeking out alternative medicines, it is best to treat symptoms at their source in order to alleviate symptoms in the long term. Finally, if digestive problems continue, there are different medications that can be explored. While medications can be effective, there are many potential side effects. Because of the risks involved, consulting a trusted medical professional before beginning these treatments is recommended, especially because persistent digestive problems could point to an underlying condition. Click on the following link to learn specific treatments for digestive problems, which begin with lifestyle changes, move onto alternative medicines, and finally, if those options do not work, medications. The most effective treatments for digestive problems typically combine lifestyle changes and alternative medicines. While food can't necessarily cure any stomach problems, eating the right foods - or the wrong ones - can have a large impact on stomach disorders. Symptoms of illnesses like irritable bowel syndrome or Crohn's disease can be improved just by avoiding certain foods or focusing on adding in some useful food groups. During menopause, women often experience digestive issues, such as bloating, constipation, and heartburn. Herbal supplements may help relieve these issues thanks to their natural compounds that aid the process of digestion. Read more to find out which supplements can help in reducing which digestive problems. 11/22/2017 Chronic stomach problems do not always have to be present to count as chronic. Often, symptoms of chronic illness may recede for months at a time or more, but without treatment, they will return after this period of remission. It is the return of symptoms that classifies a condition as chronic. 10/02/2015 Good digestion is important for overall health and well-being, and so working out why bad digestion is occurring is very important. This article looks at the link between bad habits and digestive processes to discover if bad habits can affect digestion or not, and what can be done. 09/26/2011 Many women experience digestive problems during menopause. Eating a balanced diet full of whole grains, fruits, vegetables, and lean proteins can help a person to resolve some of their digestive woes. Click here for tips to eat and drink your way to a healthier digestive system. 09/26/2011 Eating a balanced diet is one of the best ways to positively impact your overall health, including managing menopause symptoms. In order to best manage your symptoms, it is essential to choose foods high in necessary nutrients, such as fiber. Find out how to choose the best sources of fiber to best manage menopause symptoms.